Wycombe defender Alfie Mawson says all the pressure is on Plymouth Argyle going into Saturday's League Two play-off semi-final first leg at Home Park. Wycombe missed out on automatic promotion on the final day to Bury, finishing fourth as Argyle got seventh. Mawson, this week voted Wycombe's player of the season, is one of four players whose loans at the club have been extended to cover the play-offs. The 21-year-old said: "The pressure isn't on us, it's on our opponents." Mawson's Brentford team-mates Sam Saunders and Nico Yennaris, as well as Millwall's Fred Onyedinma have also been granted permission to stay at Adams Park. However, Brentford have retained a recall option for Saunders and Yennaris, should they be required for the Bees' Championship play-off campaign. Wycombe won more points away from home than any other team in the Football League this season. 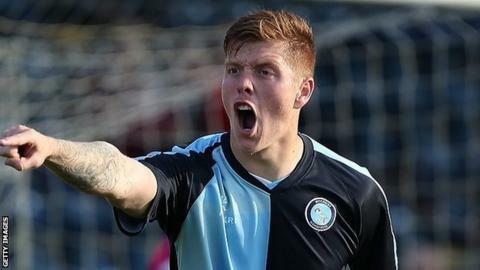 Mawson was initially signed on a one-month loan deal, but has stayed with the Chairboys throughout the campaign. "It's ridiculous to think that 84 points would have got us up [automatically] in any of the last 19 or 20 seasons," he told BBC Three Counties Radio. "But we go again and I think the lads are very optimistic, we'll attack it with nothing held back. "Personally I want to keep a clean sheet at Plymouth, but we'll go there with the mentality that we're going to score goals, like we have all season, and if we do concede, we know we have the players to score more goals than come." Manager Gareth Ainsworth said his squad had quickly recovered from the disappointment of not going up automatically. "The vibe is fine, they're a really good professional bunch lead by Stevie Craig, Paul Hayes and "Blooms" [Matt Bloomfield], the stalwart of the club - they won't let anybody be anything less than professional. "Dreams of the play-offs were almost fantasy at the start of the season, so to achieve that is fantastic for this group of boys. "It will be an intense atmosphere at Plymouth; a big and well-supported club, one of the big boys in this league if you will. "But we will travel down there and try to upset them. The league form goes out of the window now, and the players are relishing the chance to impress. "There's no way I'm thinking of Wembley yet, it's Plymouth, Plymouth, Plymouth. Getting a result down there and coming back and finishing the job at Wycombe. "To hear the sort of numbers of Wycombe fans travelling down is fantastic, we thank them and they can rest assured every player who goes on the pitch will not come off it without having given absolutely everything."